See: because it’s fall. And because I haven’t posted in a season. 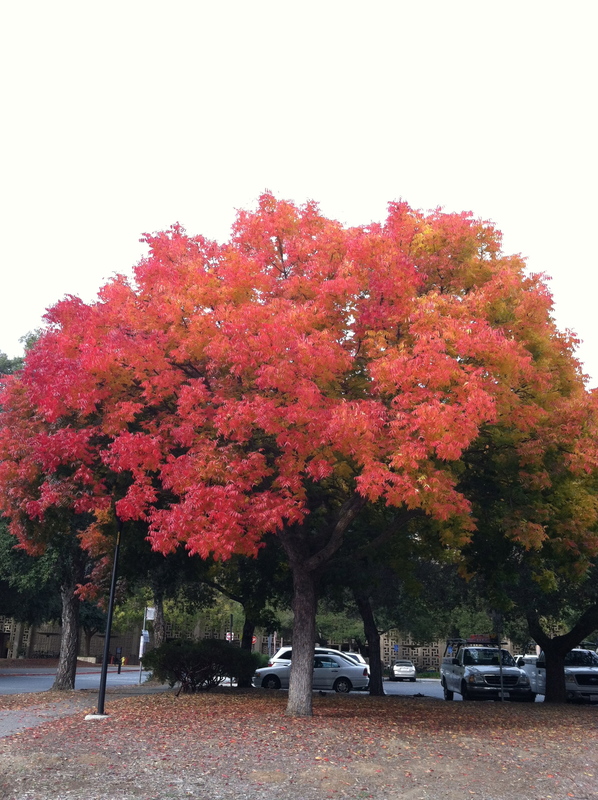 A particularly pretty Chinase pistache (Pistacia chinensis) tree at the corner of Roth and Campus Drive. 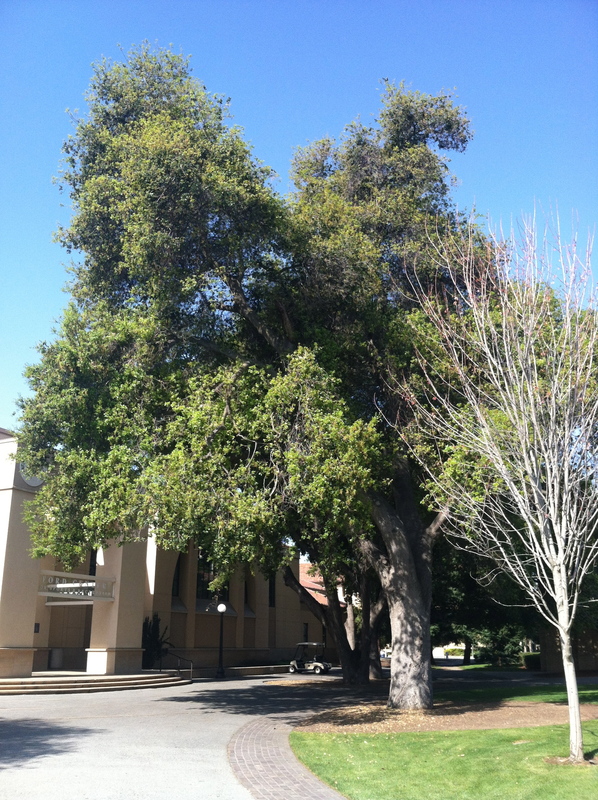 This is one of maaaaany Chinese pistache (or Chinese pistachio) trees distributed around campus in an effort to keep all our homesick transplanted students and faculty from fleeing back to their states of origin this time of year. Or possibly just to sprinkle a little extra red around the place. As you’ve probably already suspected, Pistacia chinensis is a close relative of the pistachio of culinary fame, Pistacia vera. P. vera is a Mediterranean native, and it’s in Mediterranean desserts that I like pistachio nuts the best: baklava, biscotti (recipe below), and the like. 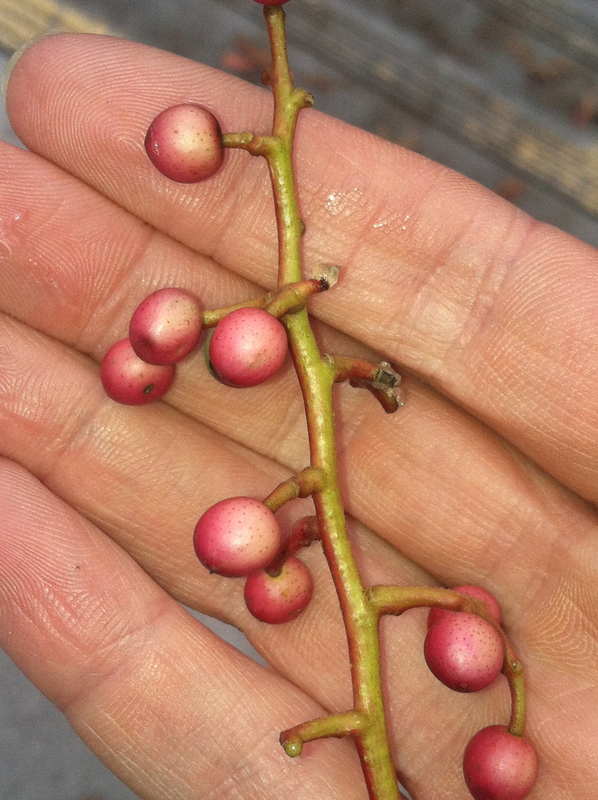 The Chinese pistachio fruits are not edible (except to birds–the bluebirds go nuts for them here), but they look like a plausible smaller relative, and unlike commercial pistachio nuts, Chinese pistachio fruits are naturally red. Fruits of the Chinese pistachio tree. They’re doused in very sticky sap, which left my fingers tacky for the rest of the day after this pic. 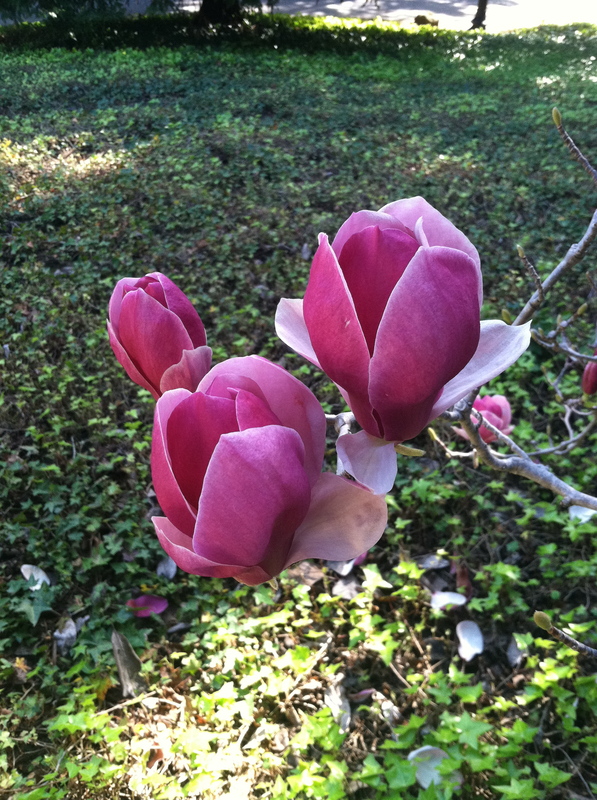 P. chinensis is common all over the Bay Area, so if you live nearby there’s a good chance a few of these are brightening up your neighborhood, too. 1. Preheat oven to 375 F; spray 1 cookie sheet with cooking spray, keep another ungreased cookie sheet on hand. Cream together butter and sugar, beat in baking powder, salt, vanilla and eggs. Stir in flour, fennel flowers, and pistachios. 2. Divide dough into 3 portions. Shape each third into a roll 8-9″ long. Place rolls several inches apart on sprayed cookie sheet, and flatten so each roll is about 2.5-3 inches wide. 3. Bake at 375 F (190 C) for 20-25 minutes. The “loaves” should be golden brown around the edges and cracked on top. Cool 30 minutes. 4. 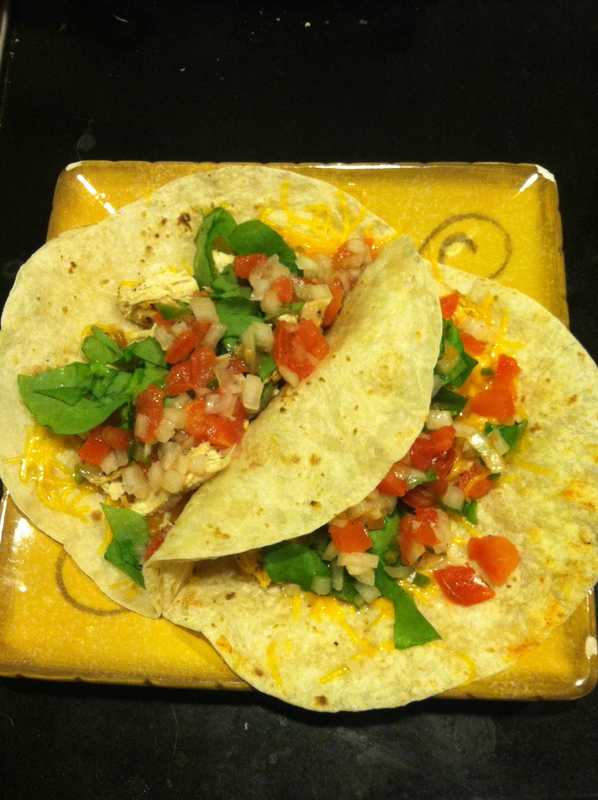 Use a sharp serrated knife to cut each roll on a diagonal into slices, about 1/2″ thick and 4″ long. Lay slices cut sides down on ungreased cookie sheet. Lower oven temp and bake at 325 F (163 C) for 8 minutes, then flip cookies and bake on the other side another 8 minutes until dry and crisp. It’s guava flower season! 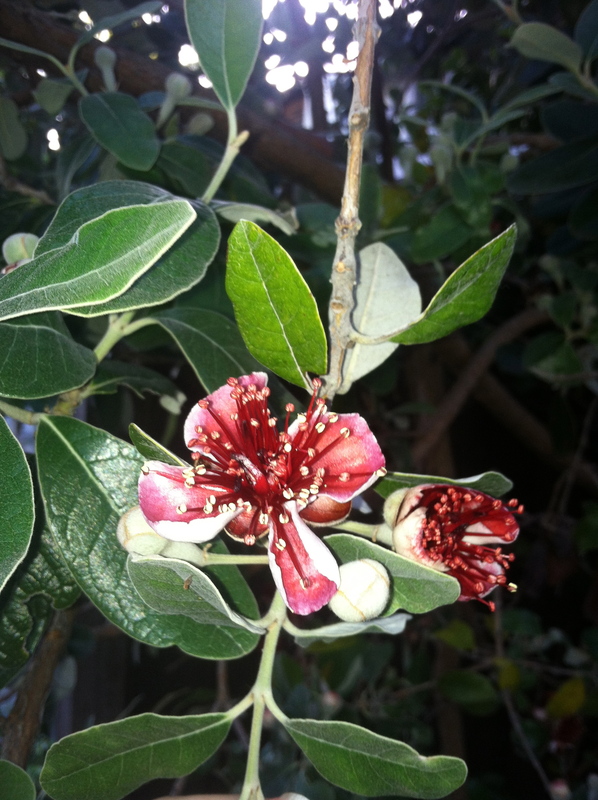 If you’re in California or the South, there’s a very good chance that someone who lives next to you is using pineapple guavas (Acca sellowiana) for their hedges or shrubbery. These Argentinian natives (also called feijoas) don’t always set fruit, but their flowers are a great snack all on their own. Pineapple guava flowers peeking out from the Berkeley shrubbery. Look for bright red clusters of stamens on tall shrubs with grey-green leaves. Then make sure that the cluster of stamens is surrounded by 4 petals: light pink on the outside, and pink-purple on the inside. On the best ones, the petals will be a little bit spongy. 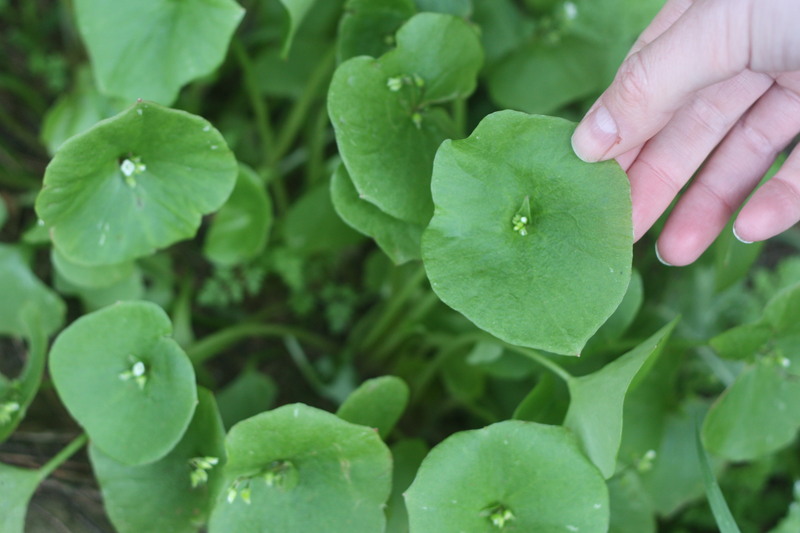 Pluck off the petals and try them (the stamens are edible too, but don’t taste like much). 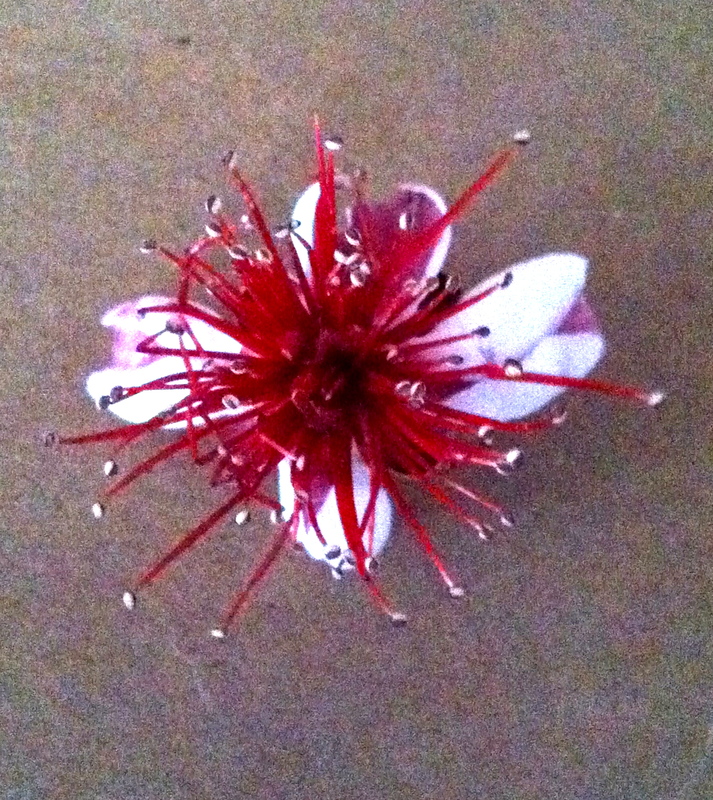 On the best guava flowers, the petals have curled so that you mostly see the light pink spongy exteriors. Delicious, right? Soft, juicy, sweet, with a kinda spicy tropical tang. 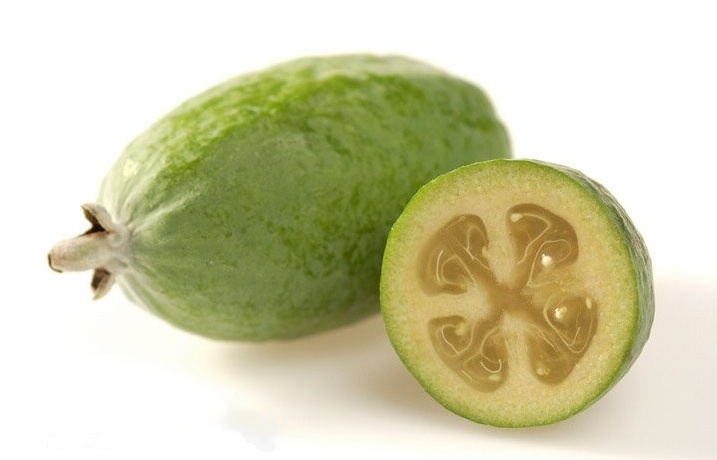 If you’ve ever had guava Kern’s nectar, you recognize the flavor, because it’s the same plant. Pineapple guavas need 50 hours of cold to set fruit, don’t set well in high temps (90 degrees or higher), and many cultivars also need a pollinator, so if you’re in a very warm climate your new snack may never mature into fruit. Still, it’s best to be optimistic and leave the stamens and pistil attached to the shrub–if you’re lucky in a few months there will be egg-sized leathery looking green fruits to eat as well. Pineapple guava fruit. Photo by HortResearch via wikimedia. I will confess to often liberating guava petals from their owners without asking permission, but it’s probably better to tell your neighbor that you’d like to eat their shrubbery. Ideally, they’ll not only be happy to let you have at it, but gratified to learn about the tasty treat in their yard. Special thanks to my college adviser Dr. Daniel Martinez, an Argentinian native himself, who introduced these to me back in the day. And a tip for fellow folks at the Stanford med school: the bushes next to the patio at LKSC should be full of these any day now. I’m also told they’re a popular cultivated fruit in New Zealand. Can anyone confirm? 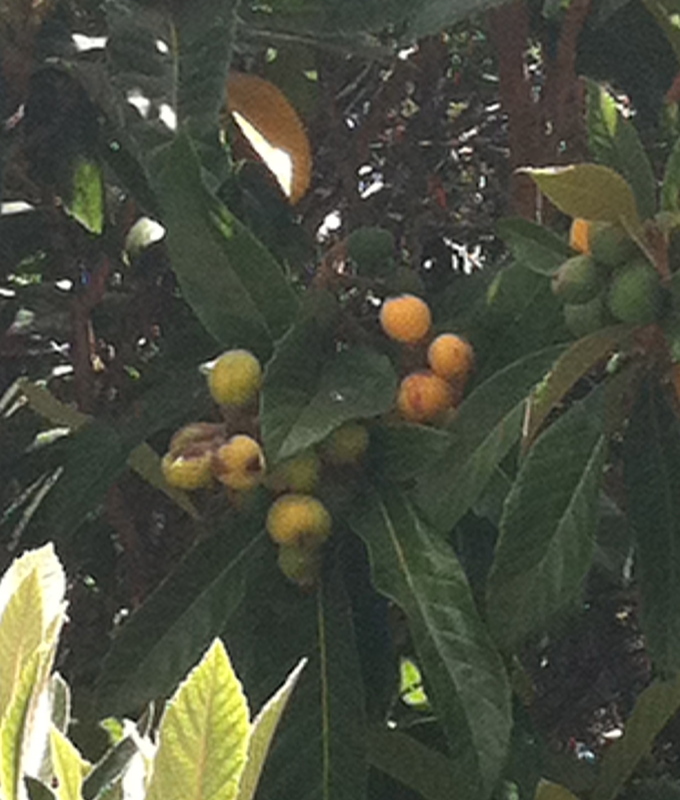 If you live anywhere in California below about 2000 feet of elevation, somewhere in your neighborhood there is a loquat tree. Your job this May/June is to find it and forage it (you’re allowed to ask the neighbor first. In fact that might be a good idea). I love these things so much, and every time I see an under-appreciated tree with its fruit littering the ground in early July it breaks my heart. You guys have to help me out. The lovely, luscious, little-loved loquat is Eriobotrya japonica, a Chinese native (confusingly), and member of the Rosaceae family, just like apples, pears, and all those Prunus species I was celebrating back in February. It’s a moderate-to-large evergreen tree that’s often used for shade, because its large glossy leaves are great at blocking the daylight. 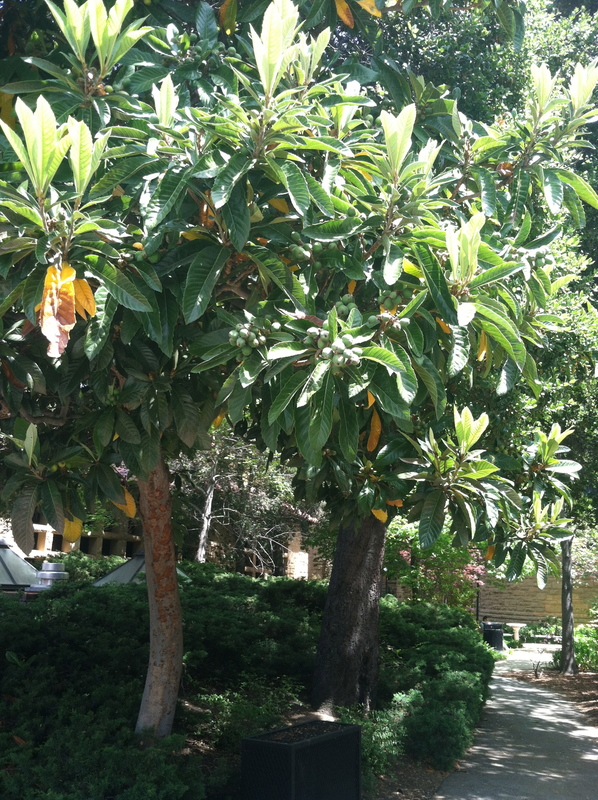 A shade-casting loquat tree in one of the east-side courtyards of Stanford's main quad. Small clusters of unripe green fruit are visible among the leaves. In December/January, it produces nondescript sweetly-scented yellowish flowers, that very very slowly give rise to clusters of fruit. In May, these reach their full size (a little smaller than a golf ball, and either round or slightly oval), and ripen to a peachy orange color. The fruit at the tops of the trees ripens first. Some of my fondest memories from college are of my friends and I foraging these off the tree-tops in Claremont, trying to reach the uppermost fruit without getting totally covered in tree bits and spiderwebs. The fruit (and the leaves) are covered in a downy fuzz, and this coupled with the color always makes me think of peaches…so much so in fact that I have trouble deciding what they actually taste like, because it’s hard to get peaches out of my mind. I think they may taste a little like raspberries with a radically different texture. 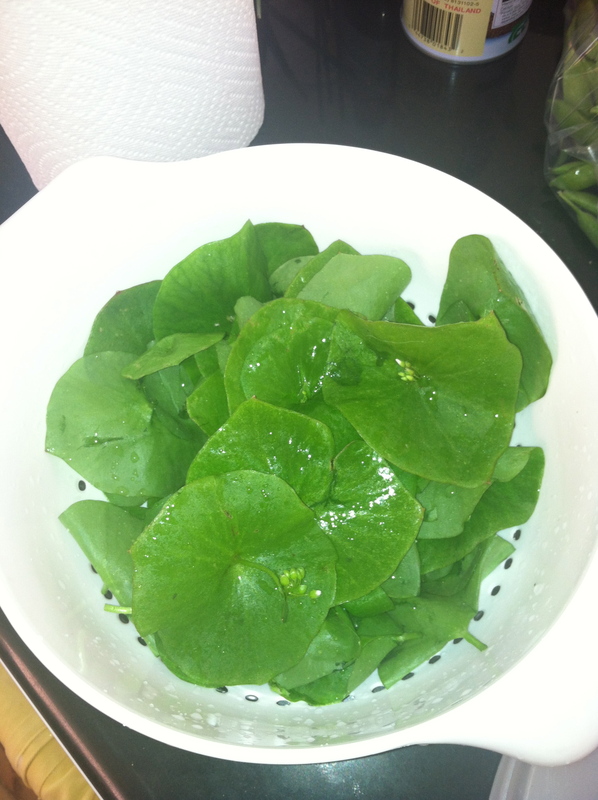 A heaping pile of miner’s lettuce to anyone who can help me pin down the flavor. 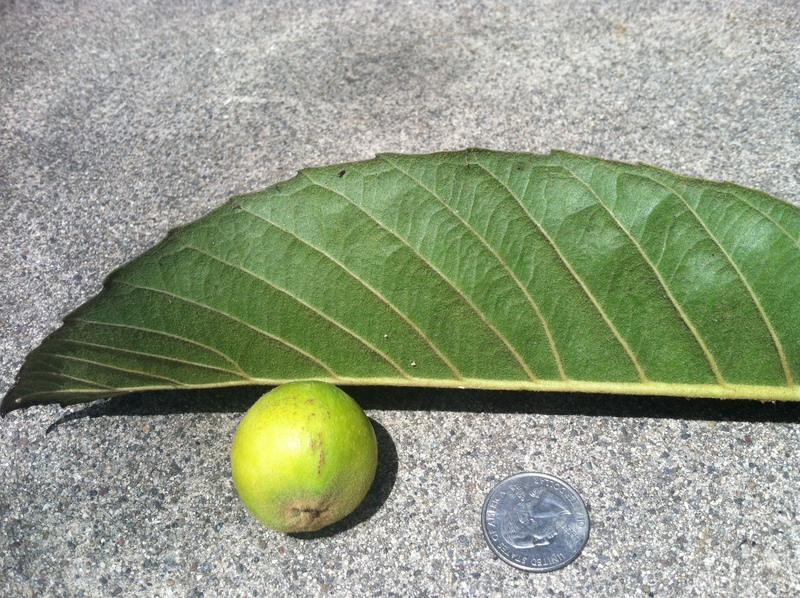 A loquat leaf and full-size unripe fruit, with quarter for scale. The fruit is best when its fully ripe, and it’s easiest to tell if this is the case by looking where the fruit meets the stem: it should be orange-yellow, and not at all green. The fruit should also pop easily off the stem. When they’re a little under-ripe, they’re a bit tart but still very good, and when they’re fully ripe they’re heavenly: very sweet and fragrant. I like them best with the skin peeled off (a word to the wise though–peeling the skin will stain your fingernails brownish if you don’t wash your hands), but you can eat the skin too if you rub off the fuzz. Inside, there are several large glossy dark-brown seeds. 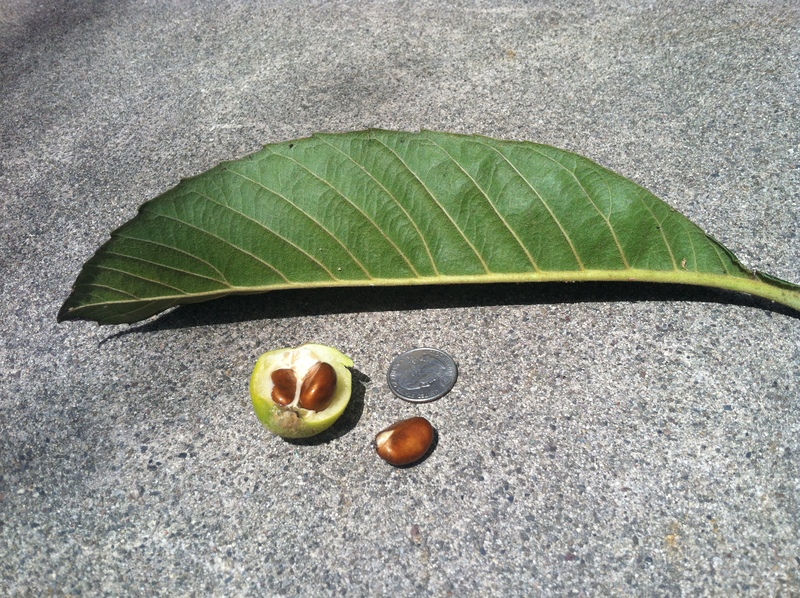 The same loquat leaf and fruit split open to show the shiny brown seeds. There can be anywhere from 1-8 seeds, usually depending on how large the fruit is. One final thing: they don’t store well (only a day or two in the fridge, max), so as you go out and find your local neighborhood loquat tree, don’t hesitate to enjoy them on the spot. Spread the word! 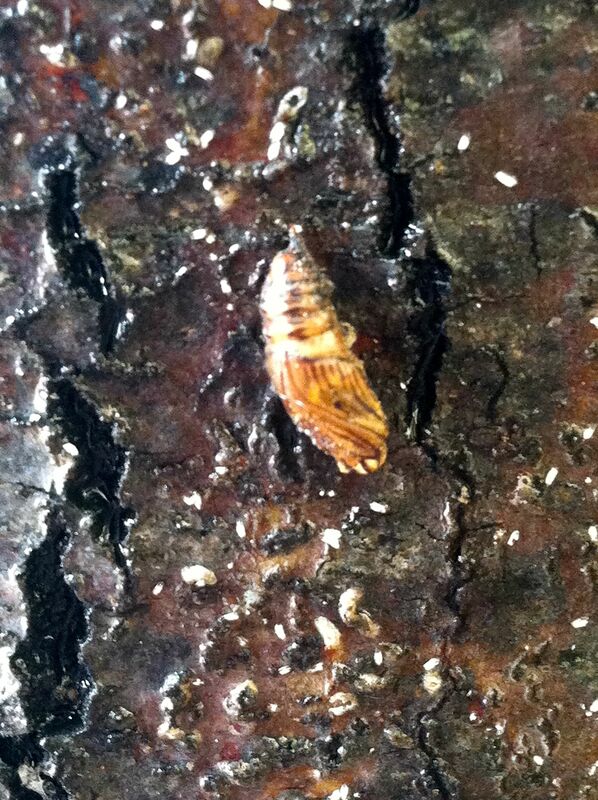 Chrysalis of a California oak moth, Phryganidia californica, found on a live oak tree near lab. I’m not sure if this is a new chrysalis or one from last fall that managed to hang on to the tree all winter, but either way it’s from a California oak moth (Phryganidia californica, aka oakworm). Last fall there were so many of these dotted all over the oak trunks and some of the nearby buildings that it looked like a plague of incontinent pigeons had been through. And the ravenous caterpillars that produced them had eaten so much live oak foliage that the trees were no longer recognizable as evergreens. By late October there were virtual clouds of moths flitting around the tree tops when I headed home in the evenings. Recently, I’ve been seeing a few young caterpillars dangling from the upper branches by their silk threads, so this could be from an early bloomer. 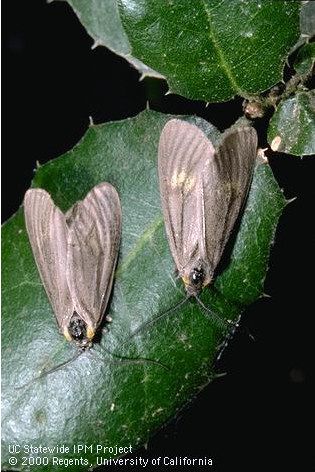 Mature oak moths. Photo by Jack Kelly Clark, University of California Agriculture and Natural Resources. Happily, with a heaping pile of March rain, the oaks have made a full leafy comeback, and are prepared to handle another onslaught of caterpillar consumption. 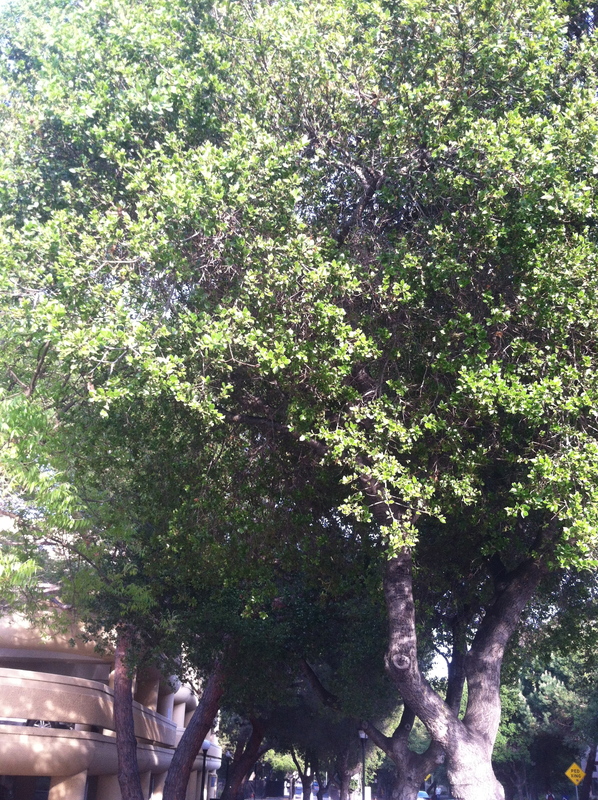 Last fall this live oak tree had been heavily defoliated by oak moth caterpillars, but with the late rains this spring it's back to being full of bright green leaves. 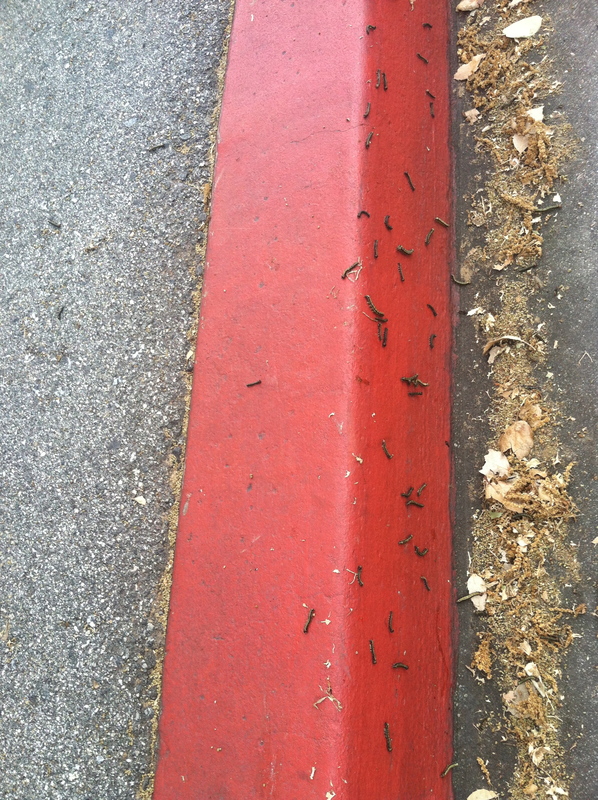 I have mixed feelings about the California oak moths. On the one hand, it’s still a bit of a thrill to find chrysalises out in the wild, and there were so many of these that it was easy to bring home a handful of twigs to give to my neighborlings (SM, now 6, and HM, 5) to watch hatch, which was fun. I also have a soft spot for things that are delicately pretty but not showy, and the black-and-tan chrysalises and softly, silvery brown-grey moths appeal, since they’re so easily overlooked in favor of bigger brighter monarchs and swallowtails. But they’re insatiable little buggers, and the caterpillars can do in a poor oak tree in an infestation year (the moths themselves don’t eat, just mate). 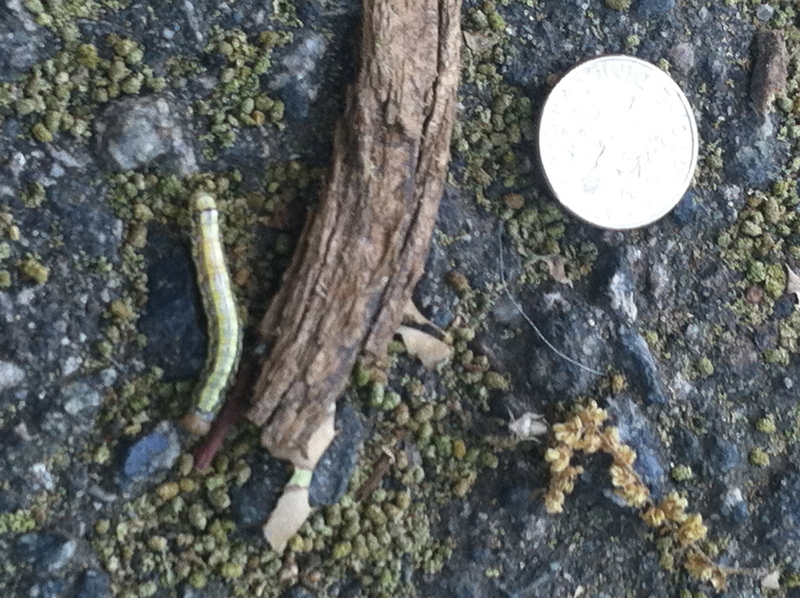 Oak trees that have been damaged by draught, other pests, or illnesses like sudden oak death (caused by the single-celled eukaryotic Phytophthora ramorum, which is related to inoffensive brown algae and diatoms) are very vulnerable to oakworms’ voraciousness. 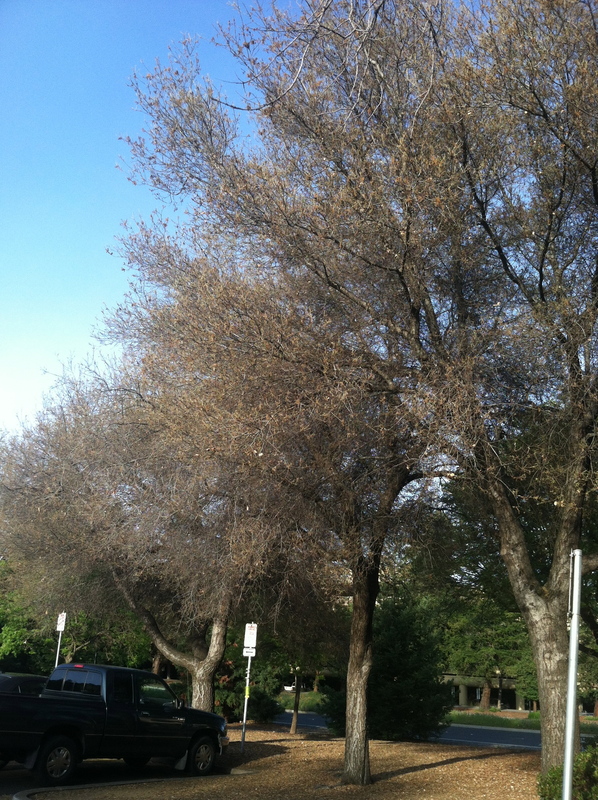 Santa Clara county, where Stanford’s located, has had bouts of sudden oak death, and it’s been a dry year, so I was happy to see that the trees had made such a robust recovery. Since the weather has been quite different this year than last (60-80% of average rainfall this year vs. 150-175% last year), I’m not sure how the oak moths will respond. I may do another post about them this fall if they reach near-apocalyptic proportions again.